This delicious recipe has been generously shared by one of our great cooks, Adelenne. She’s always coming up with great recipes which she either invents herself or adapts from various cookbooks to make her own. Adelenne is a huge source of inspiration to our Lovefoodies Facebook group and always has a tasty recipe or two to share with us. 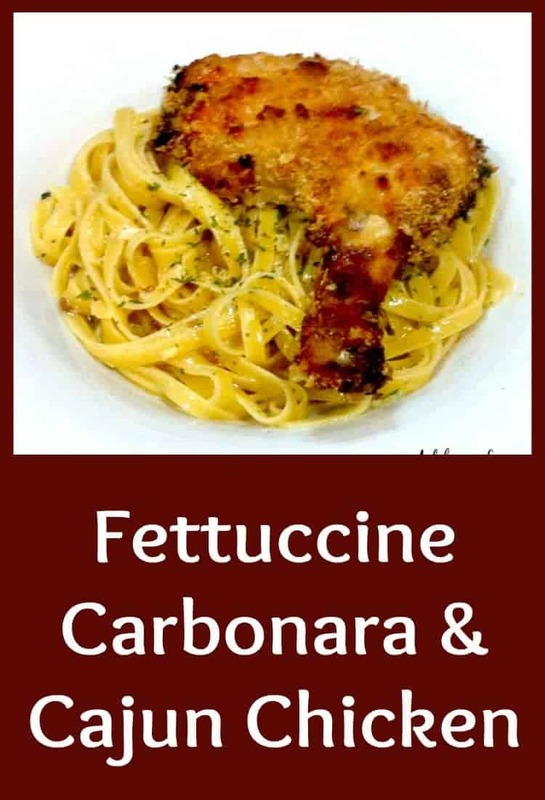 Here, we have Adelenne’s recipe for her Fettuccine Carbonara & Cajun Chicken. It’s easy and oh so tasty! So let’s see what we need to do to get this on our dinner table. Yield: Allow 1 or 2 pieces of chicken per person. 3 chicken thigh legs or other cuts you like. 1. Preheat oven to 200 C/ 400 F / Gas 6. 2. Marinade the chicken by mixing in a bowl the yoghurt and Cajun Spice. Leave to marinade for an hour or overnight is even better. 3. Shake of excess yoghurt and coat with panko or breadcrumbs before baking. 4. Place of a greased baking sheet (you can line with parchment first if you wish) and bake until golden brown for 40-50 mins. Turn halfway. 1. Put cream, eggs and Parmesan in a bowl and mix to combine. Add a little salt and pepper. Set aside. 2. Fry bacon in a pan until golden brown. Add garlic and set aside. 3. Cook fettuccine in a large pot of boiling water until al dente. Remove from stove. Drain and put fettuccine back into pot. Add the egg/cream mixture and also the bacon and garlic with the oil from the pan. Toss thoroughly until thick. The heat from the pasta will cook the egg mixture. 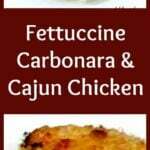 Serve with your baked Cajun chicken. Preheat oven to 200 C/ 400 F / Gas 6. Marinade the chicken by mixing in a bowl the yoghurt and Cajun Spice. Leave to marinade for an hour or overnight is even better. Shake of excess yoghurt and coat with panko or breadcrumbs before baking. Place of a greased baking sheet (you can line with parchment first if you wish) and bake until golden brown for 40-50 mins. Turn halfway. Put cream, eggs and Parmesan in a bowl and mix to combine. Add a little salt and pepper. Set aside. Fry bacon in a pan until golden brown. Add garlic and set aside. Cook fettuccine in a large pot of boiling water until al dente. Remove from stove. Drain and put fettuccine back into pot. Add the egg/cream mixture and also the bacon and garlic with the oil from the pan. Toss thoroughly until thick. The heat from the pasta will cook the egg mixture.